There’s not a lot you can say about Worms that hasn’t already been said. Once again, Team 17 have kept the original formula intact while just adding little extras here and there and tightening things up. The very strange AI and occasionally difficult controls drag it down a little, and if you weren’t a fan of Worms before, then Worms 3 won’t do anything to bring you in. But if you can’t get enough of the adorably violent annelids, this is another fine entry in the series. Haven’t had enough Worms yet? We have a look at Worms 3 on iOS. The first Worms game came out 18 years ago, and they’ve clearly been successful, as developer Team 17 have been pumping them out ever since. The core of the gameplay hasn’t changed over time, but there has been the gradual additions of new ways to play, extra layers of polish and extra ways to kill annelids in humourous fashion. 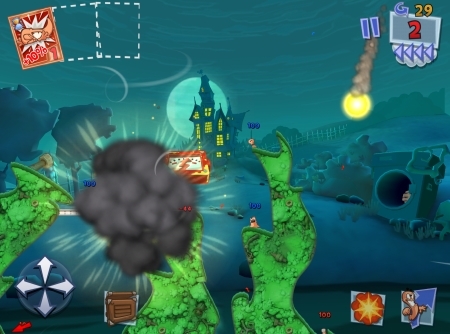 Worms 3 is the third iOS iteration of the series, designed from the ground up for touch screens, and while it has a couple of issues, there’s still some explosive fun to be had. Worms 3 works like any other game in the series. You have your own team of worms, and the idea is to use the terrain and weapons at your disposal to destroy the enemy worms. You have the usual array of weird and wonderful weapons, with mines, rockets, grenades, grannies and everything in between. There are two control schemes, one that is entirely touch based and one that uses an on screen D-Pad. The D-Pad is a little unresponsive at times, but the touch screen works OK and is more accurate. The single player modes consist of a 20+ mission campaign, a match against the AI or a survival mode where you have one worm and have to take on increasingly difficult enemies. The survival mode is great fun to play. The campaign is OK, and good practice for getting to grips with the games systems. Playing the AI is an inconsistent experience, however. Sometimes, your enemies will be able to pull off trick shots and kill you from seemingly impossible places on a regular basis. Other times, the AI worms will manage to destroy themselves. It’s a very strange and, at times, annoying experience. A new feature introduced in this game is the use of cards. These cards can be used before and after a battle, and can do things such as increase the amount of fuel in your jetpack or allow you to continue moving if you take fall damage. These cards do have a limited role, though, and don’t ruin the gameplay experience. New cards can be obtained by using the in game coins you earn through playing the game. Thankfully, there’s no in-app purchases of these coins. You can only obtain them from playing the game. There’s online multiplayer as well, with turn based gameplay and a variety of game modes to play through. You have to create a Worms specific account to play online, but you can connect to Facebook as well, to make logging in easier. There’s pass and play local multiplayer as well. The multiplayer is still great fun, slight control problems notwithstanding. Mike first started writing about video games at the age of 10 when he wrote a Sonic Chaos review for his school newspaper, and hasn't looked back since. Favourite game genres include MMOs, racing games and puzzlers, but he'll try most things once.